At a public memorial service for the victims of the shooting rampage in a Sikh temple, children and grandchildren of the dead spoke on behalf of their families. Six died when a gunman, identified by police as Wade Michael Page, burst into the temple Sunday morning. NBC's John Yang reports. Updated at 2 p.m. 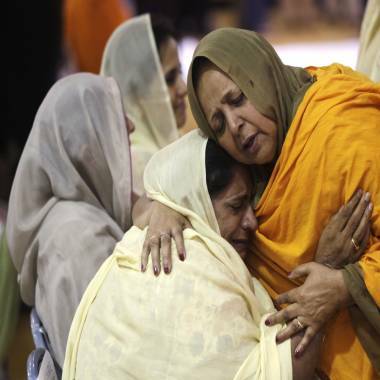 ET: As prayer, music and chanting filled the building, hundreds streamed into an Oak Creek, Wis., gymnasium Friday morning to pay their final respects to the woman and five men killed when a gunman opened fire at a Sikh temple in the community last weekend. Non-Sikhs wearing kerchiefs on their heads and Sikhs alike marched together in neat rows, with some of them stopping at times to embrace one another and exchange a few words. A priest spoke and recited prayers in the native Indian Punjabi. "Today we mourn with you, we pray with you and we support you,” Wisconsin Gov. Scott Walker told those gathered. Walker praised the Sikhs' "peaceful faith" and their reaction following the shootings, saying they had shown that the best way to respond to the violence is with love. "No matter what country your ancestors come from, no matter where you worship, no matter where you’re from, as Americans, we are one,” he said. Two women hug as community members pay respects to the victims in the mass shooting at the Sikh Temple of Wisconsin, at the Oak Creek High School on Friday. Walker was joined by U.S. Attorney General Eric Holder at the memorial service. Holder told mourners: "Last Sunday morning, this community witnessed the very worst of human kind. But for every minute, every hour, and every day since then, you have exemplified and inspired the very best in who we are." Holder said he attended the memorial "with a heavy heart" on behalf of President Barack Obama and all Americans. In a tradition to honor the dead, priests will begin a process known as Akhand Path, a reading of the entire Sikh holy book, which is expected to take about 48 hours, the BBC reported. "We want to pay homage to the spirits who are still in there," Harpreet Singh, the nephew of one of the victims, told the BBC. 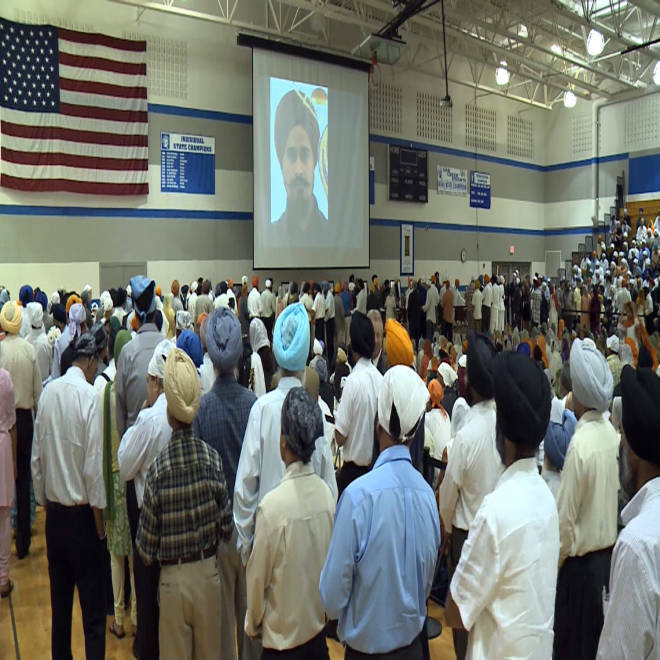 As visitors -- including several police officers -- moved toward the seats, passing six caskets, a projection screen showed photos of those killed Sunday at the Oak Creek Sikh temple. On Thursday, Sikhs were allowed to return to their temple for the first time since the shootings. Members have spent the last day painting walls and replacing blood-stained carpet. Religious leaders and parishioners keep searching for answers following the Sunday tragedy. FBI Special Agent in Charge Teresa Carlson said during a Wednesday news conference that investigators have not yet "clearly defined a motive." Wade Michael Page was identified Monday by authorities as the sole shooter. Authorities said the 40-year-old former Army sergeant and white supremacist entered the temple armed with a 9mm semiautomatic handgun. The FBI said Page died of a self-inflicted gunshot wound to the head after he was shot by police. The temple's leader told NBCChicago.com he hoped Indian-owned businesses around the world would close Friday in the victims' memory. Community members gather Friday for a memorial service for six people killed in the shooting at a Sikh temple in suburban Milwaukee.